Kice Industries and Sangati Berga announced the signing of an agreement to form a strategic alliance between the two companies. The agreement includes joint distribution, sales and promotional efforts for new and existing grain milling projects in the United States and Canada. The agreement will allow both companies to combine their resources to deliver turn-key solutions and industry-leading customer support. “We are very excited to enter into this strategic alliance with such a renowned company as Kice Industries, who are known for the high quality of their equipment and excellent customer service”, said Ricardo Pereira, President of Sangati Berga. “We are confident that together, we will offer the US and Canadian markets excellent solutions, combining the highest levels of equipment and services. Founded in 1946, Kice Industries is a fourth generation, family-owned business based in Wichita, Kan. with a team of approximately 300 employees. Kice Industries designs complete industrial air systems and builds most of the equipment specified for these systems. Applications include pneumatic conveying, dust control and aspiration systems. Kice’s Automation division provides services which include power distribution, controls engineering design, PLC/HMI programming, UL® control panel fabrication, electrical installation, and 24/7 on-call support. Kice Industries has an extensive history in the grain milling industry. Sangati Berga was founded in July 1992, with a manufacturing facility in the city of Fortaleza (Brazil). At this location Sangati Berga design and build a complete range of technologically advanced equipment for grain milling, mix plants serving the food industry and animal feed plants. 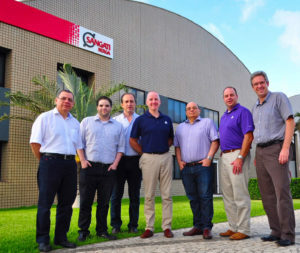 Sangati Berga also maintains a technical & commercial office in São Paulo (Brazil), from where they manage equipment sales and the execution of turnkey projects for facilities processing all kinds of cereals and their derivatives on a worldwide basis.